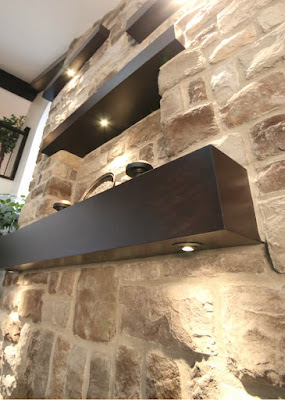 Custom wood mantels by Toronto Custom Concepts can provide your home a contemporary touch to a fireplaces via these unique mantels and shelves. Below is a picture that showcases one of our custom projects with these custom shelves. As you can see the traditional front of the fireplace is enclaved with natural stone pieces in a random pattern. The addition of the 4 custom wood mantels and shelves provide a nice contrast to the random stone pattern. Also the dark stain of the wood shelves also offsets the lighter tone of the stones. The added element of embedded LED lighting provides a beautiful accent lighting effect to the stone, especially in the evening where the fireplace is the focal point in the room when the LEDs are turned on. Hope you like these custom wood mantels !